E-readers get a bad rap—probably because there are a lot of illiterate assholes out there who hate reading. For the rest of us totally wicked people e-readers are amazing and Amazon’s rumored announcement of a new e-reader is a cause to celebrate. Liliputing is reporting that Amazon’s newest Kindle e-reader will include an accelerometer so that the device can be flipped 180 degrees for left or right hand use of the new page turning buttons. This is a very useful feature! Buttons have been absent from the Kindle since the Kindle 4 was released back in 2011, and e-reading enthusiasts have been stuck with the significantly uglier Barnes and Noble Nook if they needed that tactile sensation on a button can provide. While owners of Amazon’s kind of lame Kindle Fire have been able to flip their devices for years they’ve also had battery-hogging, full color tablets designed to do a lot more than just read ebooks really well. So this really is a big, cool deal. 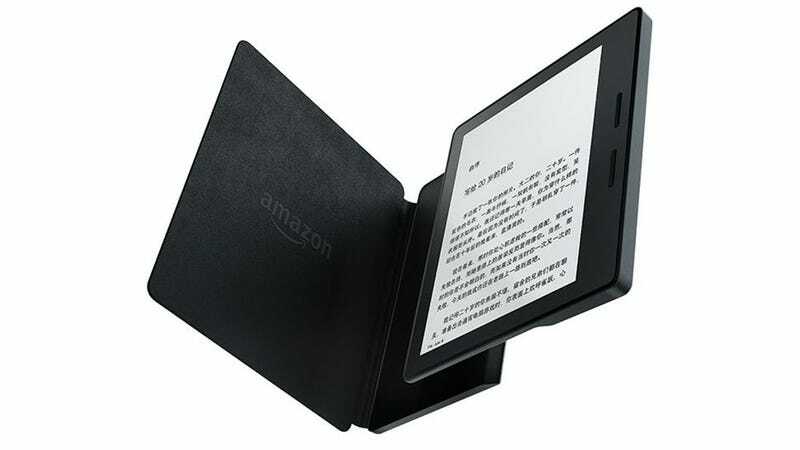 In addition to the accelerometer and buttons making their way into Amazon’s new e-reader, the Kindle will reportedly feature a thick side (8.5mm) and a thin side (3.4mm)—sort of mimicking the feeling of when you ruin the spine of a real book and bend it back to read one page at a time. There’s no word yet on when this new Kindle, dubbed the Amazon Oasis, will be available for purchase, but some leakers are saying it could happen as soon as later this week.